Brighton Pride 2018 was a runaway success with more than 57,000 people heading to the East Sussex coast to see Britney Spears perform her iconic hits, including; Toxic, Womanizer, Circus and plenty more. 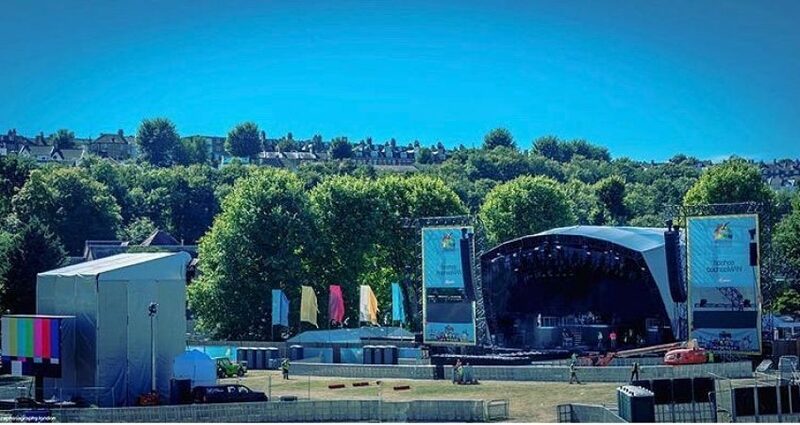 Unsurprisingly the show involved a lot of work behind the scenes and Sunbaba was more than happy to play its part in ensuring that the branding for the main stage was of the highest quality. Sunbaba provided stage scrims which measured 7.35m by 12.137m, printed on our Ultramesh, it featured reinforced edges with large eyelets and a pole pocket for easy positioning and fixing. The scrims were also finished and reinforced with a bowmer bond on the reverse side bottom edge. With plenty of colour on display, the scrims helped contribute to the overall aesthetics of the show, which marked Britney’s first appearance on UK shores since 2011. The 90 minute set bought all the glamour of her Las Vegas residency show to Brighton and Sunbaba was thrilled to be involved in bringing the stage to life.